Ascertaining evapotranspiration series by the optimized rainfall-runoff model. Variability of the annual amounts of station precipitation revealed by autocorrelation functions and power spectra. 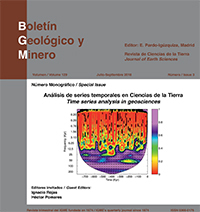 Advanced analysis methods applied to reconstructed and simulated paleoclimatic time series. Analysis of the Kobe earthquake time series via system identification and faultdetection techniques. Singular Spectrum Analysis and Autoregressive models for Ecuadorian shrimp catch forecasting. Estimation of the significance of the Foster’s wavelet spectrum by means of a permutation test and its application for paleoclimate records. Ensemble model to enhance robustness of flash flood forecasting using an Artificial Neural Network: case-study on the Gardon Basin (south-eastern France). T. Darras, A. Johannet, B. Vayssade, L. Kong-A-Siou and S.